This is my most recent loomed piece. This is my first split-loom necklace, as well as the first that involves such steep angles. 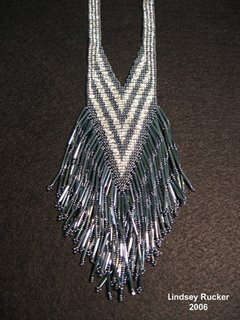 My favorite aspect of this piece is the fringe. The eye is drawn to the V-shape and the fingers are drawn to the fringe. I find that there is something irresistable about running my fingers through fringe, whether it be beaded or made of thread.